There are some nice hiking trails in the Sysmä area. For further information, please contact the tourist information in Sysmä. Near the log house short walking tours are possible (at least 3 - 5 km for beginners and advanced hikers). A nature trail (English / Finnish information offered) near the house leads through a nature reserve to a look-out. The panoramic view of Lake Päijänne from the tower all over Lake Päijänne is highly recommended. During winter enjoy the forest with a lot of snow-covered trees or take a hike on a clear blue arctic winter´s day at frozen Lake Päijänne. We like hiking on Lake Päijänne e.g. around Päijätsalo island, where the mökki is located. Enjoy a hike to the small village of Rapala opposite of the frozen bay, too. Snow shoes for 2 are available. 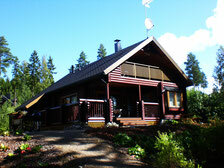 For further information, please contact the Sysmä Tourist Information Center. Have nice hikes and lots of fun the whole year around.